Foreigner experienced another surge in popularity when several of their hits were featured on the Rock of Agessoundtrack, including “I Want To Know What Love Is,” “Juke Box Hero” and “Waiting For A Girl Like You” – more songs than any other one band on the soundtrack. Hollywood quickly took note, and several more tracks were featured in hit films “Anchorman 2,” “Magic Mike” and “Pitch Perfect,” sending Foreigner downloads up 400%. The video game industry was soon to follow with the blockbuster release, “Grand Theft Auto V”. In May 2014, Atlantic Records Chairman Craig Kallman presented Mick Jones with RIAA gold and platinum digital awards for six Foreigner songs. These awards signify 500,000 and 1,000,000 downloads of Foreignerhits. That is more individual awards than any other heritage rock band, and an illustration of Foreigner’sresonance in the digital era. Foreigner kicked off 2016 with a much hailed unplugged appearance on The Today Show on February 11th followed by a short run of New York area sold out acoustic shows culminating with an epic concert at The Lincoln Center as part of the acclaimed American Songbook Series. These appearances coincided with the release of Foreigner’s first ever live acoustic album In Concert: Unplugged. The band’s royalties are donated to JDRF (Juvenile Diabetes Research Foundation) and the album is available exclusively via Amazon. 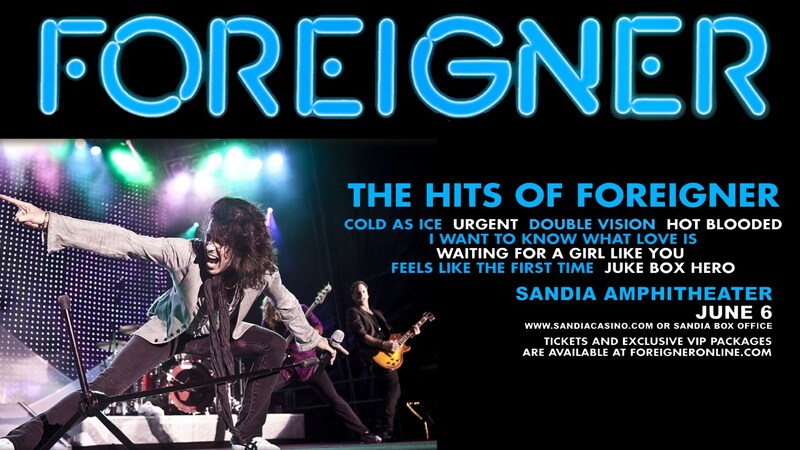 Foreignerrecorded this unique acoustic album at a once-in-a-lifetime private concert hosted by Edsel B. Ford II on August 24, 2015 at the Ford Motor Company Conference & Event Center in Detroit, MI. In October 2016, Foreigner performed for the very first time at New York’s iconic Carnegie Hall with a sold out acoustic show. The show highlighted the band’s ongoing relationship with the GRAMMY Museum’s initiative to promote music education in our nation’s schools. It included an a cappella contest among New York high schools who competed for a $5,000 prize donated by the band.